The Tambo Rays are a spirited collaboration between siblings Brian and Sara DaMert. Featuring Sara on vocals and Brian on guitar, they’ve set art rock ablaze with their bittersweet pop flavor. 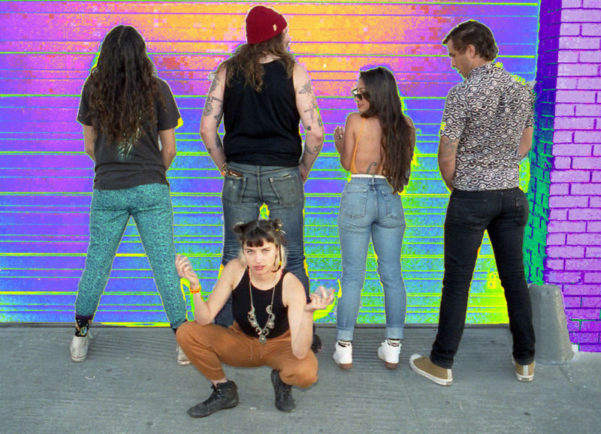 Backed by Greg Sellin on bass and Bob Jakubs on drums, The Tambo Rays playful showmanship has propelled them on stage with tUnE-yArDs, The Go Team, SOKO the Cat, White Fence, Dead Meadow, PAPA, and Gothic Tropic. The DaMerts and Sellin are no strangers to playing major venues with national headliners. Opportunity arose for Brian, Sara and Greg to tour in WATERS, formed by Van Pierszalowski (former frontman of Port O’Brien). In 2014 and 2015 they performed across the country supporting major acts: Weezer, Tegan and Sara, Misterwives, Matt and Kim, Magic Man, and Cold War Kids, and appearing on national TV shows Conan O’Brien and Carson Daly. Amid all the fun and success, a shadow overcast Brian and Sara. Their father, a joyous rainbow-making toy inventor, had fallen mysteriously ill and in the summer of 2015 passed away from ALS. In the turmoil of loss Brian and Sara channeled their pain into music. What came out was a vibrant, prismatic EP contrasting their grief with an ecstatic homage to their dreamer father. The new Tambo Rays sound, fueled by Brian and Sara’s fiery sparkle, ignites the flame within all of our hearts.